This year's recent and merciful break from a pattern of lean snow years has brought Sierra snowpack up to levels not seen since 2011. While the total is nowhere near enough snowpack to be considered a miracle year that ends the region's prolonged drought, there's no denying that this year's 5- to 7-foot snowbanks, pristine white blankets over montane meadows, and the snowy contours of steep granite faces feels more than a little miraculous. For backcountry snow sport enthusiasts, this year has been a fantastic return to form that has offered opportunities for snowshoeing, cross-country skiing, and backcountry downhill. And if the weather gods continue to favor the region as the El Niño pattern loses a little of its momentum, a mild spring could mean creeks and rivers that flow high in the late spring and late into summer, freshly charged alpine lakes, and smaller and more isolated wildfires later in the summer and early fall. South Fork of the Kings River on the Kanawyer Loop Trail. Photo by Aron Bosworth. Last season’s Rough Fire began on July 31 near Hume Lake and quickly spread to become one of the nation’s largest fires of the 2015 season. Two of California’s most beautiful national parks, Sequoia and Kings Canyon, were heavily affected. By August 15, Highway 180, which leads into Cedar Grove in Kings Canyon National park, had been closed to visitors, and the Cedar Grove area was closed completely at the end of the season. The Kings Canyon Lodge, a privately owned and operated accommodation north of Hume Lake and outside of national park land, was completely incinerated, and Grant Grove and other areas of Kings Canyon National Park were evacuated. In terms of acreage, Sequoia suffered the most, and more than 82,000 acres were burned; 9,400 acres were burned in Kings Canyon National Park. Smoke-related hospitalizations in the area were dramatically higher, and even visitors who explored sections of the parks that were well away from the fire lines felt the effects. It was a very difficult year to visit these incredible places, to say the least. And yet the tremendous efforts made to protect significant landmarks in both parks were largely successful: Grant Grove remains, General Sherman stands as tall as ever, and the views from Moro Rock have never been so poignant. The same robust snowpack that is healing this charred area, charging the rivers and streams, and saturating parched soil has made extensive surveys of the damage difficult, but the National Parks Service has set a target date of April 25 to reopen Highway 180 and provide access into Cedar Grove and Road’s End. This is a vital year for access, too: visitor numbers to our national parks are at an all-time high, and these numbers are only expected to increase with the 2016 centennial celebrations. Both parks remain excellent destinations for the 2016 season, and between the fire, the unusually high snowpack, and the centennial, visitors who plan trips into Sequoia and Kings Canyon this year will be part of a truly unique moment in the history of both parks. 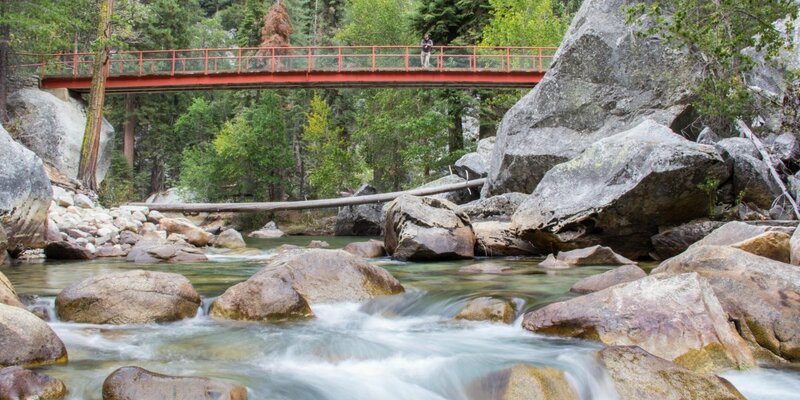 If you are fortunate enough to be planning a trip once the snow melts and the roads open, be sure to check out our West Slope Itinerary for Sequoia + Kings Canyon to help you plan for the highlights.